Yvonne here with another pink card for Breast cancer Awareness month. And again I would like to give away this card to someone who needs a cheer up. 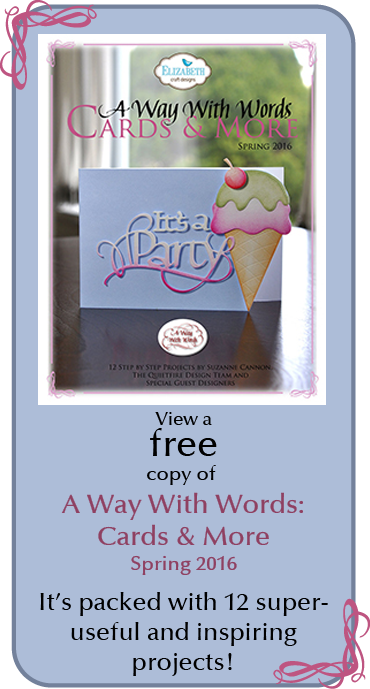 All you have to do is leave a comment under this blogpost and mention that you know someone who you would like this card being sent to. A random "winner" will be chosen on Monday and announced here on the Quietfire blog on Tuesday. The winner may contact me (per private email) to provide me with the address and a personal note you would like on the card. Please do know I live in The Netherlands so it will take at least a week for the card to arrive. - Mulberry flowers, berries, satin Ribbon, lace. Please contact me by email (to be found on the right bar of my blog) for the adress the card is to be sent to and the personal message you would like to be written on the card. As Breast Cancer Awareness month draws to a close, we must remember to keep those who it affects in our thoughts year round. I originally made this stamp for my mother, who suffered mostly in silence from a chronic illness for many years and kept herself going through love of life and friends. As with so many, her illness did not show much on the outside most of the time. When Robin Williams died, this quote was the first thing I thought of. 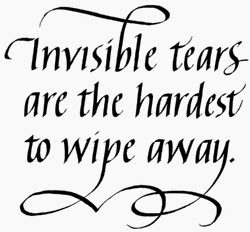 Invisible Tears is this week's Tuesday Winsday giveaway. It will end on the usual time on Tuesday - my apologies for posting late. I was away communing with nature in the snowy Rockies with family! the new "A Smile is the Best Decoration" stamp. Isn't it gorgeous! Delicata ink and embossed it with silver powder to give it a really shiny metallic look. around the card and i finished it with some silver metallic thread and bells. I think i am going to do a few more of these to send out for Christmas this year. They were really easy to make and i am very happy with how it came out. Thanks for stopping by and have a wonderful week!! 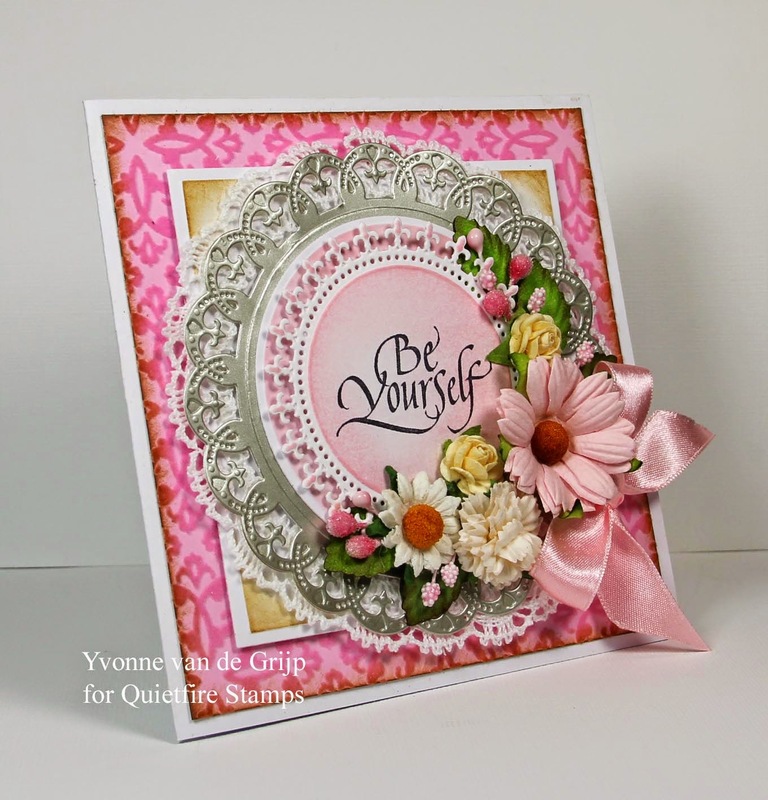 Yvonne here with a new card using the latest Quietfire stamps( set "Just for You"). 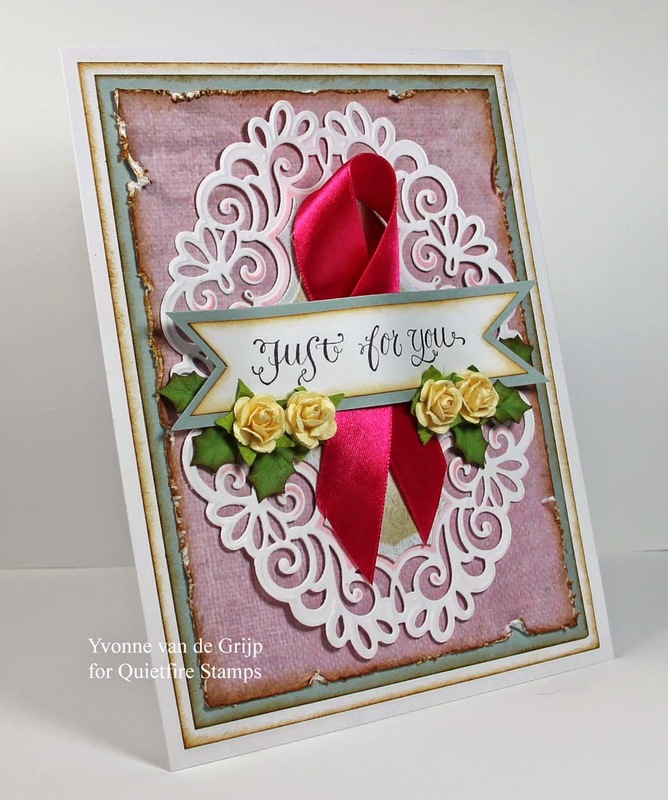 Since it´s Breast Awareness month, I made a pink ribbon card. I would like to send my card on behalf of one of you to someone who could really use a cheer up. We will pick a random "winner" to be announced in my next Quietfire blogpost (coming Friday the 31st). Then (per private email) you can send me the adress and personal note you would like on the card. 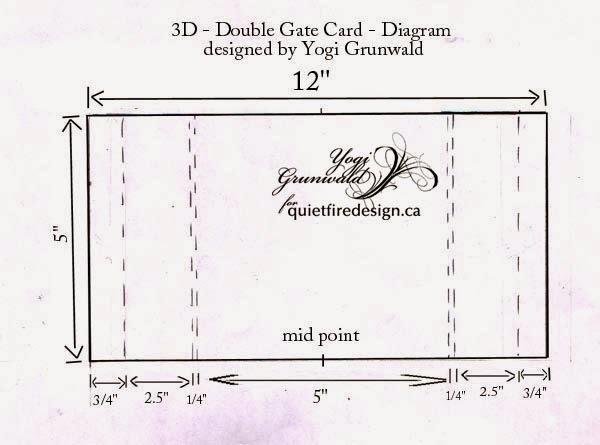 Yogi here today with another Xmas card done in a 3D double fold gate card style I designed (you can't have enough Xmas cards... my stash is growing BIG GRIN). The diagram for the card is at the bottom of the post. I scored my red textured card (see diagram below). Attached separate pieces for the flaps. 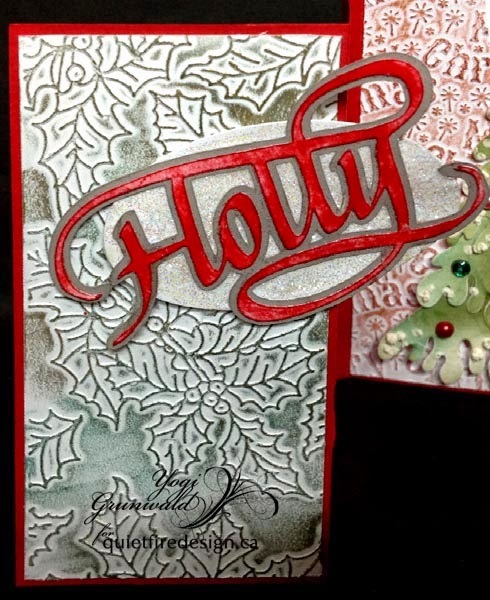 I embossed white cardstock using Crafters Companion "Merry Christmas folder & Sheena Douglas "Holly folder. Rubbed the high points with Rub n Buff. Merry with a red and the holly with a gold and a touch of a green. Trimmed them down to leave a scant 1/16" all around and adhered to card. eCut the "Holly & Ivy" on white cardstock and colored while on mat with Distress "Festive Berry". Removed from mat and applied Versamark all over and clear embossed. Cut a shadow of the words and colored with "Pumice Stone" Adhered the two elements together. Die cut the ovals (Spellbinders) from white cardstock, applied PVA glue all over and adhered the word then while glue is still wet, sprinkled with Distress glitter "Star Dust". Brushed off excess. Adhered to either side of card flaps. 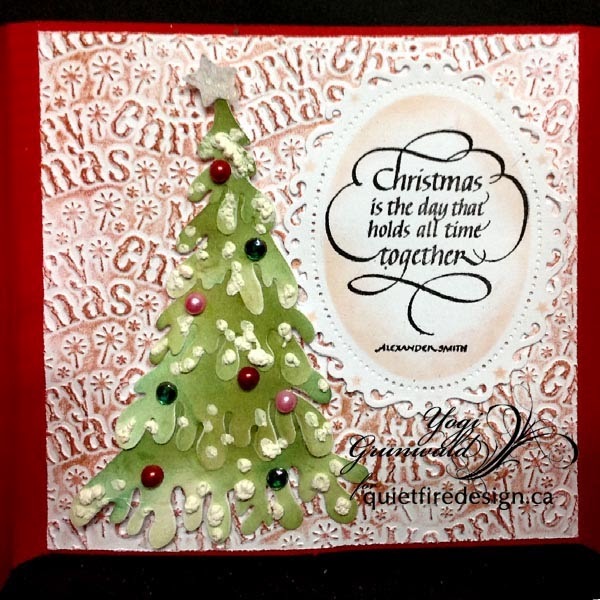 Die cut the Xmas tree (Dee's Distinctively) and sponged with Distress greens ("Forest Moss" & "Pine Needles"). Adhered the elements together, then applied splotches using a Marvy Puffy Velvet white pen. Heat activated. Adhered to card inside. Added the various colored gems and pearls. Punched out a star (McGill) from white cardstock, covered with glue and sprinkled with the glitter. adhered to tree top. 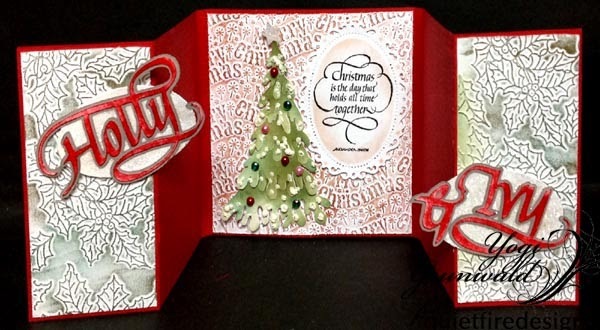 Stamped the quote ("Christmas is the Day" 9 pce set) on white cardstock and die cut with Spellbinders "Floral Ovals" and sponged edges with a dirty red sponge. Adhered to inside of card. Scored as indicated. Then adhere the flaps. To alter the size, just find the middle of your cardstock. Score equal distance on both sides of the middle. Then score at the thickness you want, then score (equal to the mid point to your first score). Then whatever is left will be what you adhered your flaps. The flaps can even extend past the width of your card. Trim to height desired. 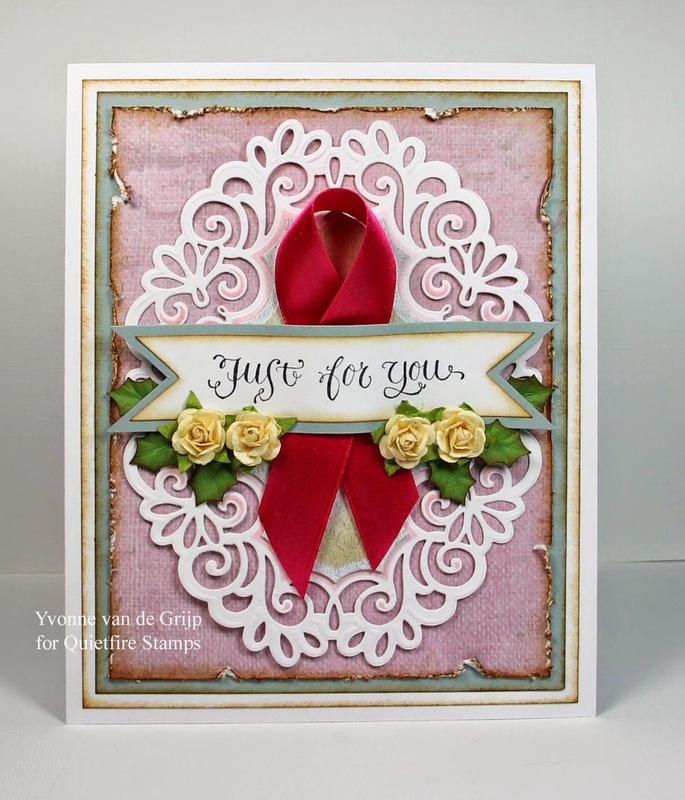 If you missed it, Julia shared two gorgeous cards with us here. Today she is sharing three more! Well gentle reader of course I can't leave the Quiefire Design stamps alone. I'm too old to change and so I've continued to make cards that feature text on the front....it can describe the intention of the inside, issue an immediate greeting, convey wisdom...you get it. And then there's humour too. Love this. This card of course, follows my tradition and is easy to make. The shoe stamp is Dawn Houser for Inkadinkado, stamped in good old Black Versafine ink and then re-stamped immediately (second generation ink). The two were then cut out (it is a one shoe image). The background image, a Marianne stamp, is stamped in second generation of Dove Grey Stazon; then the rose head and leaves are incredibly lightly coloured and washed with water to pale them down. The 'incredible' part of this is that I managed not to be too heavy handed. (But then you aren't privvy to the number of false starts I made either...). I used a ruler to tear the postcard image from the card, coloured the torn edge with Victorian Velvet Distress Stain, and matted and layered it onto a black pre-fold card. Stamp the sentiment (The Perfect Pair of Shoes) - again black Versafine, and give it drying time. (Ask me how I know to advise you about this). Lastly, just glue the cut out shoes on - lightest behind. Stick the front shoe at a jaunty angle over the first one so as to slightly create the illusion of a pair! Now....send your lovely card to anyone you know who's trying something new, starting up, starting over or considering anything. A frightened woman doing DT work, for example. Well I had to really, didn't I? I was quite insensible over the choice over at Quietfire Design, and consider myself to have been very strong indeed in choosing only two from so many beautiful Christmas related texts. I may be late to the Kraft party, but this year I've used it more than ever, and see no sign of stopping! 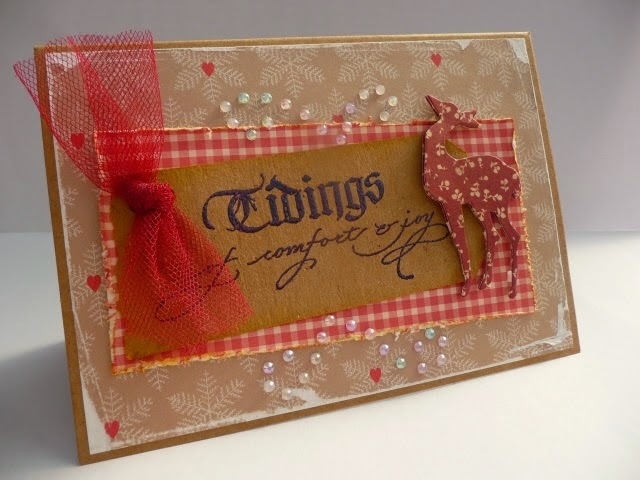 This card features the Tidings text and a die by Sizzix under the Tim Holtz signature line. 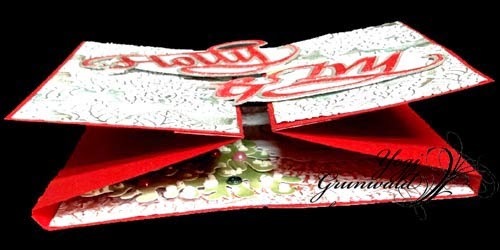 The papers are from a single set called Krafty Christmas by Dovecraft. I coloured the edges of the tag and the gingham paper with light touches of Vintage Photo Distress Ink (off a sponge), the sentiment is embossed with Cosmic Shimmer embossing powder: Blue Raspberry Aurora. I can't say that word. Aurora. I stuck the gems on one at a time, they are from an old pack that I can't identify...and you can tell that I didn't have a template! See what I mean - Kraft and Red again! LOVE this cheeky message! 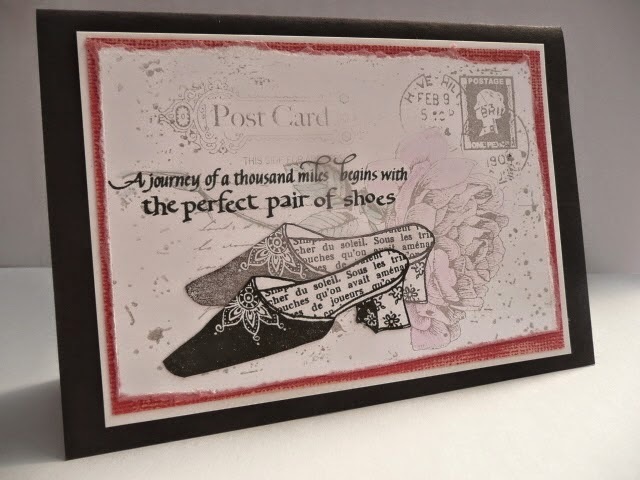 Here's a Dolly Mama stamp from Penny Black, stamped and embossed with White powder. I cut her out but left a decent margin around her...to allow the image to stand out a bit and to avoid too much cussing at the fussy cut job I'd given myself! She's coloured with sponges and various Distress Inks (before cutting out)...no careful colouring here - if I want to repeat this card, the cutting has to be the only slow part! The Kraft mat is embossed with a plaid folder from Design Objectives (DO Crafts) and the printed stock is by My Mind's Eye....the ruled print is the other side of the pattern print, so only one piece was harmed for the making of this card. I've given her gobbly eyes too...well, she is trying to hide a fib after all. The text is embossed with WOW Red powder. The quality of the lettering and the rubber means that these Quietfire stamps are a gift to emboss, and in my opinion, that shows them at their best on an otherwise busy card. We'd like to thank Julia for her wonderful projects and entertaining instructions! I don't think I've ever chuckled so much when I've been editing. What Julia didn't mention is that she is the founder of WOYWW - What's On your Workdesk? Wednesday. Participants photograph projects they are working on and post them to their own blogs, then hop over to WOWW and link their blog with all the others. "Desk hopping at its best" Hop on over and check it out! 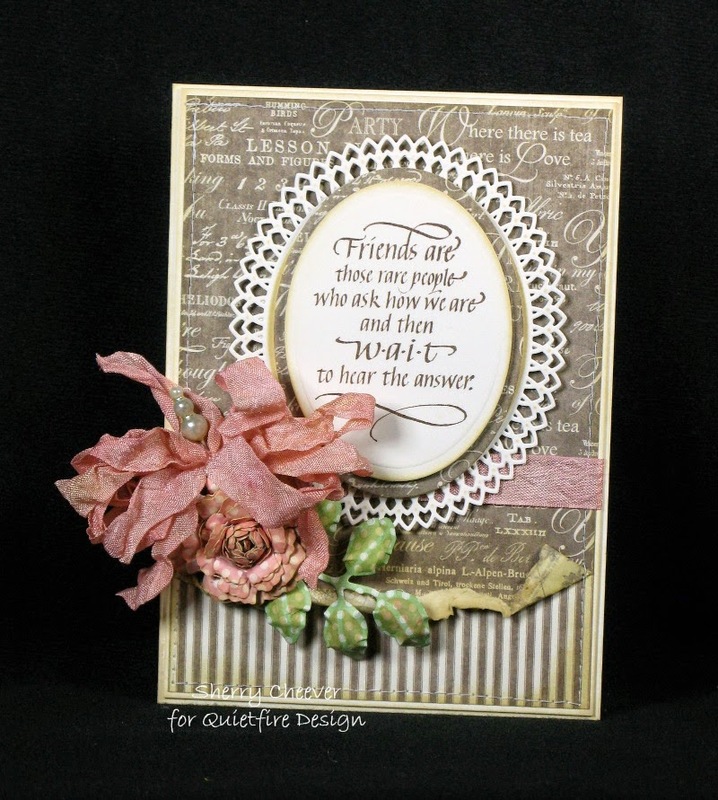 Since Sherry created this beautiful card yesterday using the newly re-designed (and mounted!) 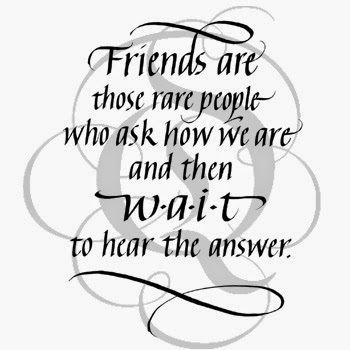 Friends are Those Rare People stamp, it is this week's giveaway! Good morning! Sherry here today and I have a 5x7” card to share using the newly redesigned stamp, Friends Are Those Rare People (which now comes mounted on cling). I used the Graphic 45 Botanical Tea Collection for the background papers and flower. 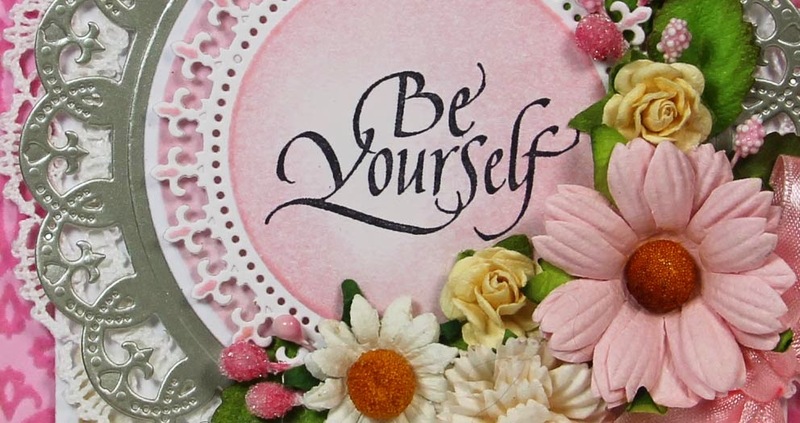 The sentiment was stamped on cream cardstock (to coordinate with the card base) in Potting Soil, then die cut/embossed with Spellbinders Ovals. 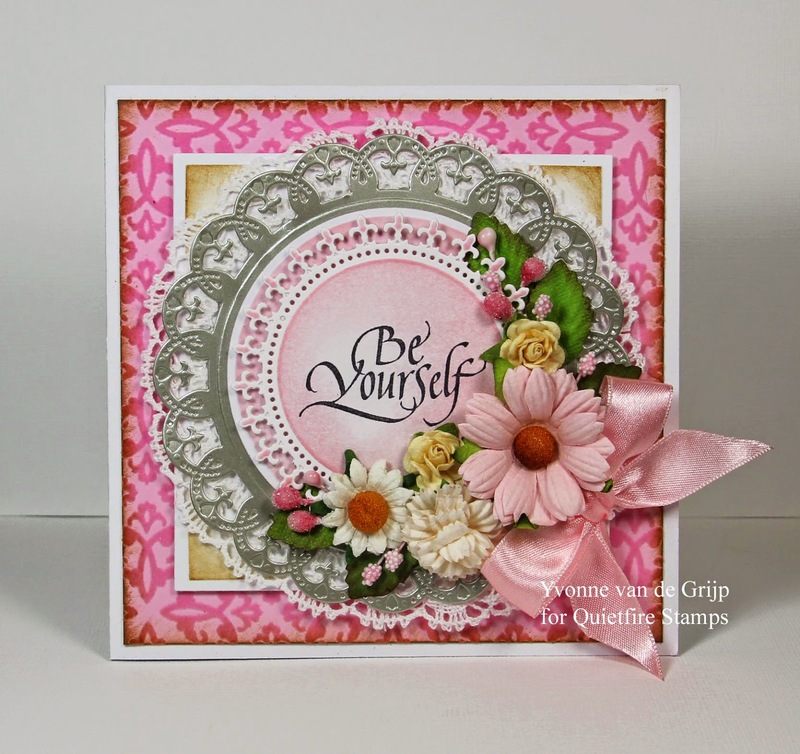 The bottom oval was die cut/embossed with the new Oval Bliss. The ribbon came out of my stash jar (already dyed so I don’t remember the color of ink), but I did want pink (October Breast Cancer Awareness Month) to match the flower. This is my reminder to all you ladies out there to schedule your mammograms and be screened. The ladies in my family have gone together annually for the last 10+ years. We get our screenings, have lunch and make a day of it. If you haven’t schedule your screening yet, please do so! That’s all for me today . . . thanks for stopping by and joining me! Quietfire Design - Graphic 45, Botanical Tea, 12x12"
Hi Everyone! This is Holly, and I'm sharing a couple cards today that have the same masked design, yet look so different. e-cut file. You get SO MUCH with this file! I just need the tree today. I laid the tree mask on white card stock, off to the side a bit, then sponged on DISTRESS INKS, peeled paint, fired brick and stormy sky. I applied the inks more heavily around the tree and card edges. Using the same inks, I stamped the leaves randomly, hoping for a breezy day look. The sentiment was stamped with jet black ARCHIVAL INK. 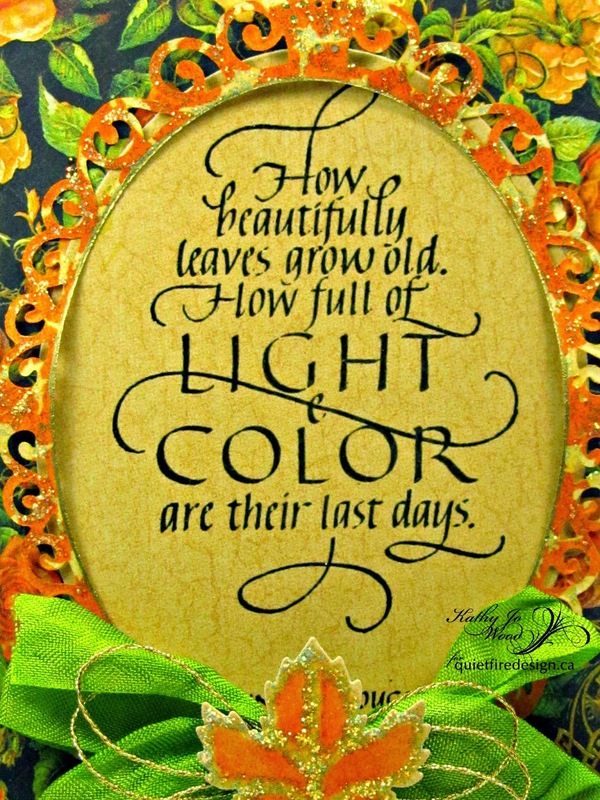 The sentiment and leaves are from HOW BEAUTIFULLY THE LEAVES GROW OLD stamp set. Love it! On a scrap of white card stock, I stamped a few more leaves, cut them out, and stuck them to the lower area of the card. So simple, I had to give you another one. The second card starts with stamping Friendship is a Sheltering Tree (FRIENDSHIP QUOTEMARKS SET) all over the white card stock, using dried marigold and antique linen distress inks. The tree mask was placed over the stamping, again to the left side a bit, then sponged over with faded jeans, broken china and chipped sapphire distress inks. Two stamps from THE WOODS WOULD BE VERY SILENT were stamped on white card stock, then cut with Spellbinders CLASSIC OVALS. The ovals were sponged around the edges with more antique linen and dried marigold ink. All three pieces were then edged with jet black archival ink by rolling the edges against the ink pad. The ovals were attached with foam tape and black gems were added to the card base. I hope you try masking. It provides an easy background for your card. Hello! 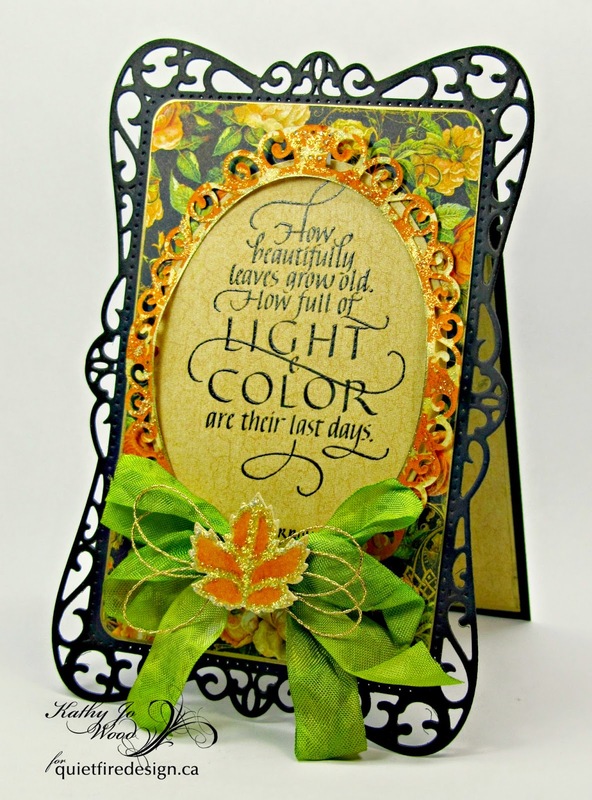 Kathy Jo here sharing a fall card using the exquisite new stamp from Quietfire, How Beautifully Leaves Grow Old. The black card stock base was die cut using Spellbinders' Timeless Rectangles. Graphic 45's An Eerie Tale paper was used for the rest of the card. 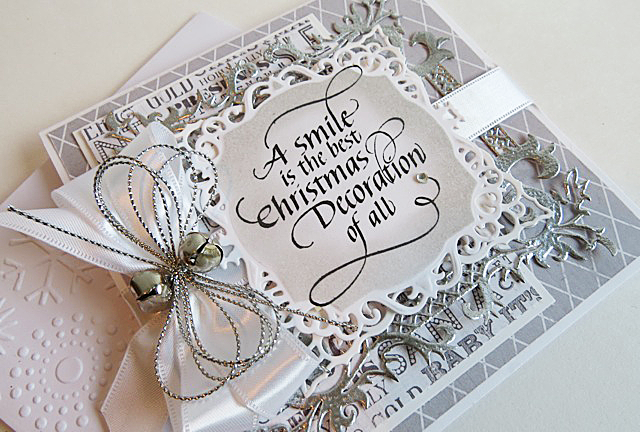 Spellbinders' Elegant Ovals and Classic Ovals were used for the sentiment. The sentiment was heat embossed in black as shown. Seam binding was dyed using Distress Stain in Peeled Paint and Mowed Lawn. 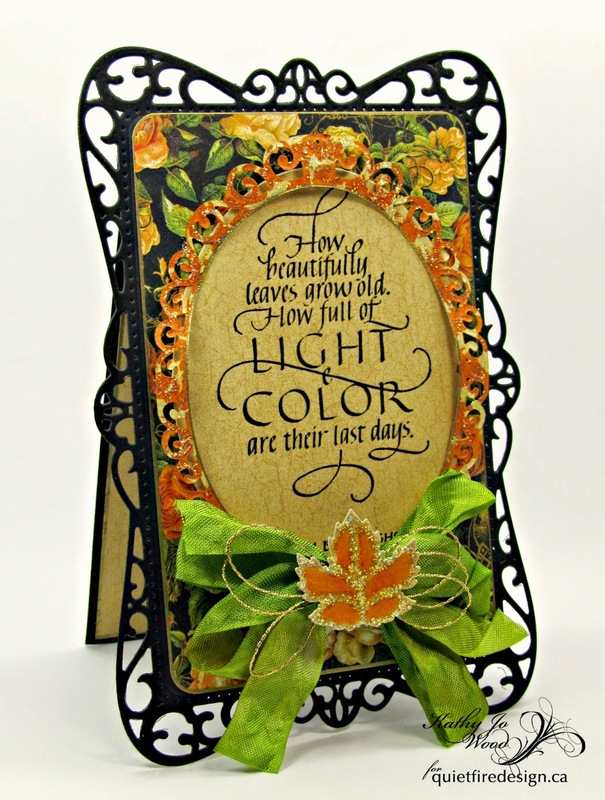 A wee maple leaf was die cut using Spellbinders Little Leaf Sets and colored using Distress Ink in Spiced Marmalade. Stickles was applied to the leaf and the frame. Thanks so much for stopping by! I do hope you enjoyed the autumn card using the newly released stamp from Quietfire. Be sure to check out the other new releases...you won't be disappointed! 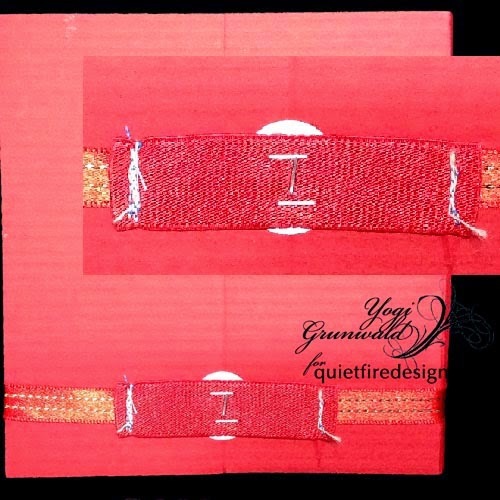 Walnut Hollow - Quietfire Blog Hop Prize Winner! Walnut Hollow & Quietfire Blog Hop - Last Day!